In a Bal Oyra basement, something sweet may be about to turn sour. Ligrod gro-Muzar and Hradell plan their business. Ask around town about the latest rumors. Head to the basement and talk to Ligrod gro-Muzar. Threaten Ligrod gro-Muzar about the Legion. Kill both smugglers and report to an Imperial Guard in which you'll receive 200 gold. When asked about the latest rumors, people around Tel Ouada might mention that Ligrod gro-Muzar and Hradell have been going into the basement of the Census and Excise Offices several times in recent weeks. Nobody knows what they're doing down there, but most people are a bit suspicious. If you head into the basement yourself, you'll find the two standing by a crate with money on it. It turns out they're moon sugar dealers - and they offer you a cut if you'll make a delivery for them. You have a choice to make. If you agree to their offer, Ligrod gives you ten portions of moon sugar and tells you to take it to Shabhi in The Black Ogre Tavern. Head to the tavern and find Shabhi, who at first is annoyed with you and claims to have been expecting twenty portions. This turns out to be a joke, and she's really only expecting ten - although she will buy the extra if you happen to have it. She pays the full price of 50 gold per portion, so this is a good opportunity to shift any samples you happen to possess. Take the money back to Ligrod, who takes 350 gold, leaving you with your cut of 150 - plus the extra 500 if you sold another ten units to Shabhi. If you don't want to get involved in the moon sugar trade, you have two options: blackmail them for your silence or report them to the Imperial Legion. If you tell them you'll keep your mouth shut for a price, Ligrod will give you 150 gold and that's the end of the story. If you decide to report them, the pair will attack at once. You don't have to tell them what you're going to do, of course. Simply talk to a member of the Legion and tell them about the situation. Unfortunately if you do this, the pair disappear before you can deal with them, leaving a Hastily Scrawled Note to tell you what they think of your actions. If both the smugglers escape, the Legion give you 50 gold for breaking up the racket. If you kill one of them, you receive 125 gold, and if both of them are dead you get 200 gold. 10 Ligrod gro-Muzar and Hradell have been meeting in the basement of the Bal Oyra Census and Excise Office. The general belief is that their meetings are less than legal. 20 Ligrod gro-Muzar and Hradell have informed me that they are smuggling moon sugar, and have offered me a cut if I will help them to make the next delivery. 30 I have agreed to help with the delivery. 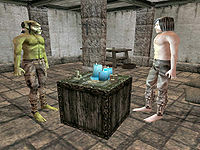 The smugglers gave me some moon sugar and instructions to deliver it to Shabhi at the Black Ogre. 40 Shabhi told me that I was supposed to bring twice as much moon sugar. It sounds like Hradell and Ligrod gro-Muzar set me up to take a fall. 50 When I told Shabhi that this was all Ligrod gro-Muzar and Hradell had given me, she admitted that she was making a joke and paid for the moon sugar. 60 When I produced the balance of moon sugar out of pocket, Shabhi admitted that she was joking, but bought the extra moon sugar from me anyway. 70 I have killed Shabhi. 80 I told Ligrod gro-Muzar and Hradell that I intended to alert the guards to their smuggling. They attacked me. 90 I informed the guards that Ligrod gro-Muzar and Hradell have been smuggling. They want me to go and attempt to subdue the smugglers. 100 Finishes quest I have promised my silence to Ligrod gro-Muzar and Hradell for 150 gold. 110 Finishes quest I brought the money from Shabhi back to Ligrod gro-Muzar and Hradell. 120 When I returned to the Census & Excise basement, I found a note vowing vengeance upon me. 130 Finishes quest The Imperial Legion thanked me for getting rid of the smugglers. This page was last modified on 6 March 2019, at 07:20.